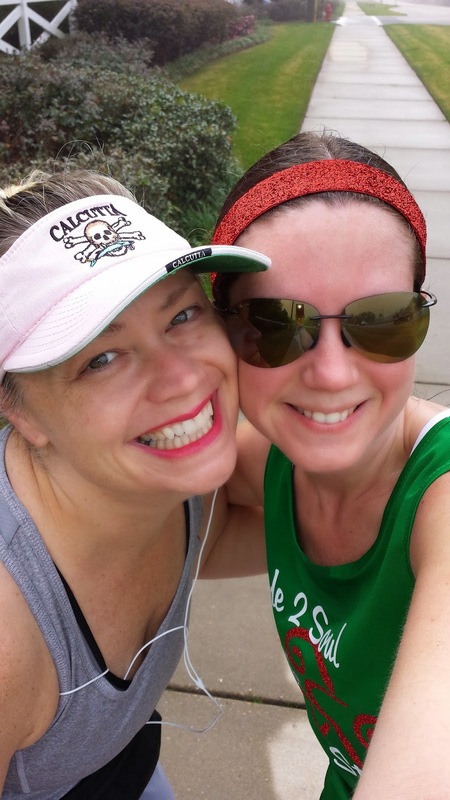 Road Runner Girl: #RnRNola Training Week 1! So last week I got the go ahead from Dr. Justin to go ahead and start ramping up my mileage...but slowly. Most of you know I've been dealing with a calf strain since my sub 2 half marathon in October. The calf is doing so much better! Dr. Justin actually released me from treatment last Wednesday! 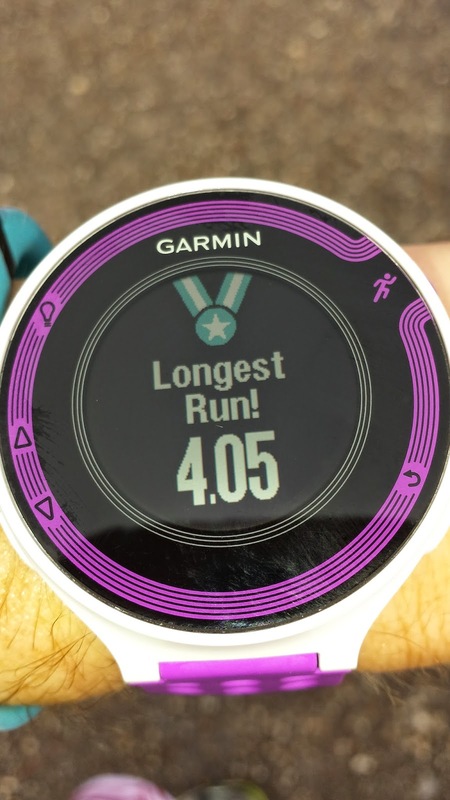 So it was time for my first long run since November 1st! Rock 'n' Roll New Orleans training has begun! 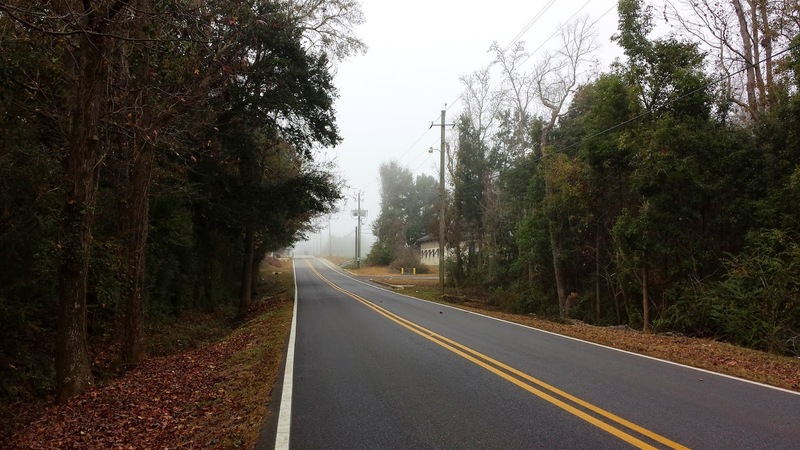 Per doctor's orders to ramp up slowly I decided to run 4 miles as my long run this past weekend. This would be the longest I had run since my 10K race on my birthday! I was a little nervous. I just hoped the calf would cooperate and feel good. This run was also special for another reason. I was supposed to be in Memphis running the St. Jude Memphis Half Marathon. But due to my calf injury I decided to DNS that race. I was a little sad seeing everyone's posts about the race. 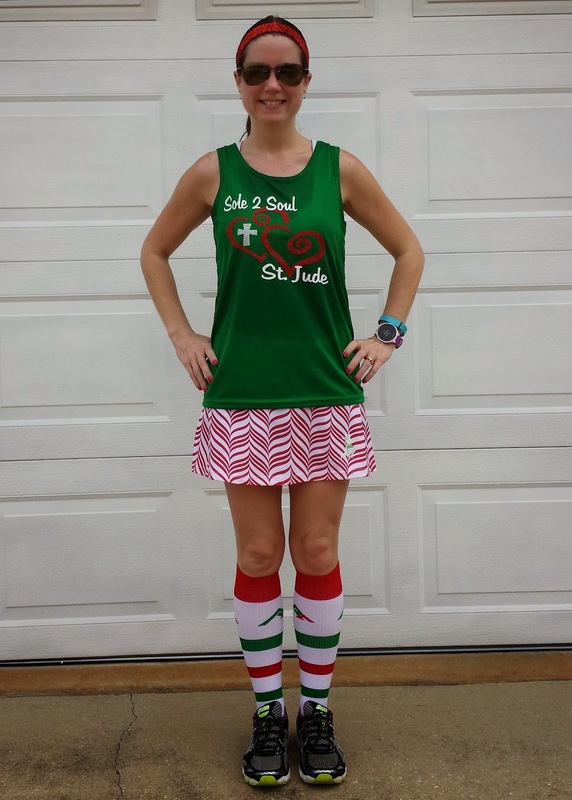 But I decided to go ahead and put on my race outfit and dedicate my first long run in quite some time to the kids at St. Jude. I couldn't run the half for them but I gave that 4 miles my all! The run started out great! The calf was feeling good! I got into a good pace and was feeling so blessed to be out there running more than 2 miles! I kept thinking about all the kids at St. Jude that would like to run but can't. I was running for them! I reached the first mile and saw some of my Sole2Soul Sisters that are training for a marathon. They were at mile 17 of their 18 miler! It was so good seeing them! I just enjoyed the run and the scenery. I was running one of my normal routes but since I hadn't been able to run long in so long I hadn't run this route in forever! 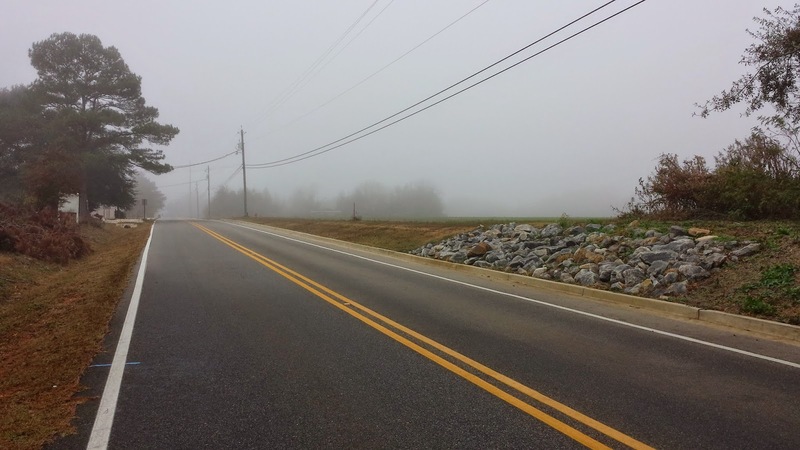 It was very humid and very foggy during this run though. It made it a little tough. Before I knew it I had reached 3 miles! The calf was still doing great although I could feel a little tightness in it. But no pain. I was at mile 3.5 and I saw my friend Susanne! She was out for her run too! We stopped for a quick picture! It was so good to see her! I finished up the run strong! I had done it! I had run 4 miles!!! That is nothing compared to what I normally do but I was so happy since it had been so long since I'd run longer than 2 miles! Hopefully the calf continues to heal and I can keep training strong! 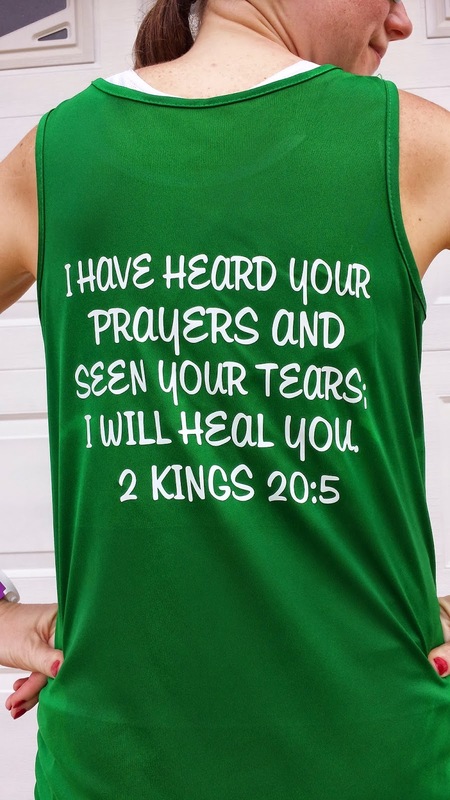 And I have to show you the Bible verse we had printed on the back of our shirts. It was very appropriate for the St. Jude race! 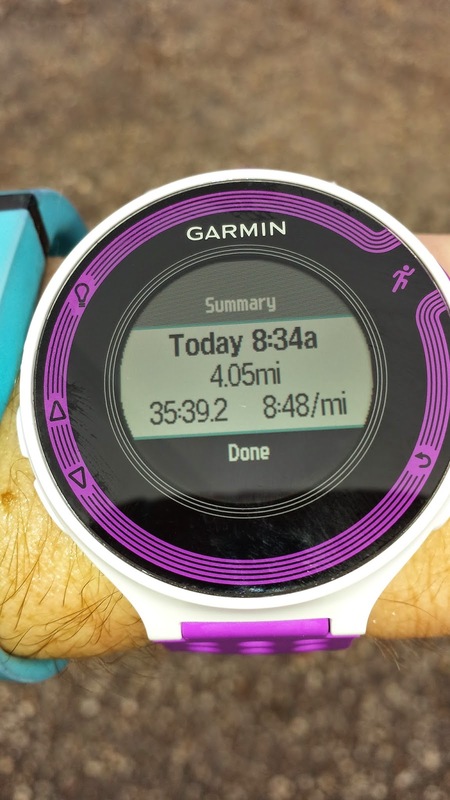 And yes...since I got my new Garmin on my birthday and was injured this is the longest run this watch has seen lol! QOTD: Are you nervous to start running again after injury?